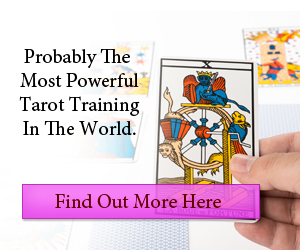 Do you want to discover how to read tarot cards? Are you interested in uncovering the past, understanding the present, and divining the future? …but also how to expand your knowledge through the symbolism, associations and applications for everyday life. Even though it’s aimed at teaching beginners how to use tarot cards, it’s thorough enough to help advanced readers. 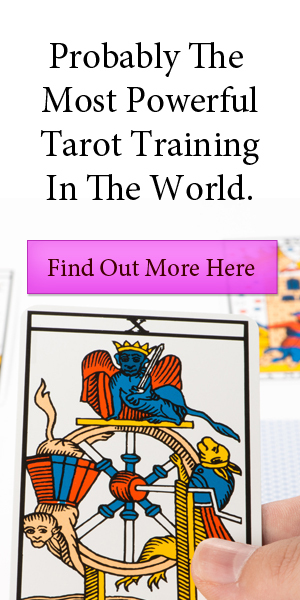 Are you in a hurry and want to learn to read Tarot as fast as possible? The Tarot as we know it dates back to the 14th Century, although they weren’t always used for divination. Gambling and card games were the main focus of their usage and in 1332, King Alfonse XI of Leon and Castile banned them, followed by the Catholic Church, who advised they were instruments of the Devil. Back then, the Italian decks were named “Tarocchi” which translates as trumps or triumphs. They were used in a game known as “Tarok” and then the French gave the cards the name we know today – Tarot. Some believe that the symbolic imagery was created as a kind of memory system for those learning the occult. In Western culture, normal playing cards were used for fortune telling and soon the Tarot took over, with Gypsies spreading the popular pastime throughout Europe. From the 19th Century onward, a resurgence of fascination with the occult was taking off, with the Golden Dawn movement spreading the use of Tarot further. One of their members – Arthur Edward Waite – was responsible for designing the most popular deck that is still used today, along with the assistance of artist Pamela Coleman Smith. The occult symbolism and artwork was drawn from many different systems and magical philosophies. 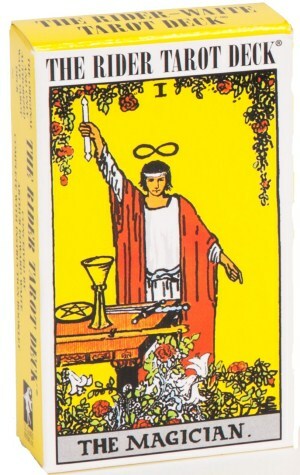 The current methodology of Tarot interpretation started in the 1970’s and along with a growing interest in psychoanalysis, the use of Tarot cards grew exponentially. The New Age movement furthered the spread of this form of fortune telling, with thousands of new decks being produced annually. Starting with the Mamluk cards imported from Turkey to Western Europe in the 14th Century, the history of the imagery on the different decks changed from the focus on a parlor game – where Italian aristocrats used them to tell stories about each other – to divination about the past, present and future. Reflecting various aspects of life and the real world, the imagery used in Tarot decks also evolved to include Christian symbolism and soon became more esoteric as time went on, incorporating ancient spiritual and religious iconography, historical events and mystical symbolism. The Rider Waite deck is the most commonly used, due to its rich symbolism – which allows for both classical and unique interpretations for deep understanding of the subconscious. The imagery lends itself to complete immersion in the occult meanings behind each card, making the Tarot education all the more fascinating. This deck is probably the best one to use when first setting out to learn the Tarot and from there – after getting the basic symbolism down pat – you can explore other decks and decide what feels right for you. Each deck has its own depictions and interpretations of the symbolism, so make sure you choose one that resonates. The Tarot of Marseille deck is considered the standard design behind many decks available today. Considered to have been developed in Italy, it was introduced into France in 1499. The artwork was created by using woodcut techniques and colored by hand. The French occultist Papus is credited with naming this deck. The Etteilla deck was created by publisher and teacher Jean-Baptiste Alliette in 1789 and is one of the first decks designed specifically for divination. It’s called the Egyptian Tarot due to the ancient Egyptian symbolism and also includes astrology and other esoteric imagery. Of course, it’s important to choose a deck that resonates with you. Some believe that – ideally – you shouldn’t purchase your own deck. It should be received as a gift, but then – it all depends on how superstitious you are. The bottom line is that you should feel comfortable with the imagery. Make sure that you have a good look at the cards. Does the symbolism make sense to you? How do you feel when handling the cards? Try out a few decks, as you won’t know if they’re right for you until you actually use them. Later on, you’ll try different decks and eventually pick a favorite. The best way to learn Tarot is to treat your cards with respect. Find a nice piece of material (preferably natural – like cotton, silk etc.) and wrap your deck carefully before storing them in a nice box. Some people like placing a talisman or a piece of quartz crystal in the box – to amplify the power of the deck. Try not to spread your cards on any old surface. Using them in a sacred space helps to keep them “sacred” and shows respect. Some people don’t let others touch their decks, but when you’re reading for others, it can’t be avoided. Periodically cleanse them by passing them over the smoke from a smudge stick. Understanding the meaning of Tarot cards includes knowledge of the Arcanas. The following instructions are only a guide for beginners, as you’ll eventually learn that the Tarot is a journey that shifts and changes throughout your life, according to what kind of metaphysical subjects you become involved in. Minor Arcana – also known as the suit cards, including Wands, Cups, Swords and Pentacles. Numbered from Ace (one) to ten, they also include the Court cards – discussed later on. The Minor Arcana governs everyday events and each suit and number has a different meaning. Wands: Things that are mostly in the realm of thought and ideas; the beginning stages of development. Cups: The emotional element which transforms thought into action. Swords: The struggle and effort that propels the action towards the fulfillment of the goal. Pentacles: The manifestation of the original idea; the outcome and fruits of your labor. Major Arcana – also known as the trump cards – represent major events in life, due to their important effects. There are 22 cards in the Major Arcana, starting with The Magician and ending with The Fool, although some say – seeing as The Fool is numbered 0 – that The Fool is the beginning of the journey. Consisting of the Pages, Knights, Queens and Kings which come after the tenth card in each of the suits in the Minor Arcana. They represent the people, time frames and vocations in life. Their meanings are enhanced by the suits: for example – the Page of Swords is a spirited, dynamic person or situation. Pages: Young people, new situations, communication; an emerging aspect of your personality. Knights: Sudden changes and situations, new people in your life, courage, the attainment of knowledge. Queens: Creativity, motherly or mature people, a new level of understanding and awareness. Kings: Leadership, authority, fatherly or protective people, force of will and public recognition or status. Learning how to read Tarot cards involves the story of a journey via pictures – beginning with stepping out into the world and ending with completion and achievement of lifelong goals. The symbolism involved in the artwork can vary from deck to deck, but usually there are specific and general types of iconography and symbols. Many elements are used in the illustration of the Tarot, including color, numbers, symbols and situations. It’s important to educate yourself and research the various symbols used in your deck. You’ll find that certain symbols will easily draw your attention at any given time, which is your intuition coming into play. While there are universal meanings and definitions associated with the symbols in the Tarot, the most important thing is to recognize what those symbols mean for you personally. For example: a heart can represent love or the emotions to one person, where someone else might think of courage or strength. Take a close look at each card and you’ll see many symbolic components. In the Rider Waite deck, there’s just as much going on in the background as there is in the foreground. Clouds and cliffs can represent the conditions in the background of your life, depending on how steep the cliff is or how stormy the clouds are. Spend time getting to know the basics of the imagery in the cards. For example: with The Fool, you’ll see the little white dog barking at the heels of the young man stepping out on his journey. He represents the consciousness warning the young man that he is about to step off the cliff – blithely unaware of the danger. Each Tarot card is numbered (apart from the Court cards.) In Numerology, the base numbers are 1 through 9 and must always be reduced to a single digit. 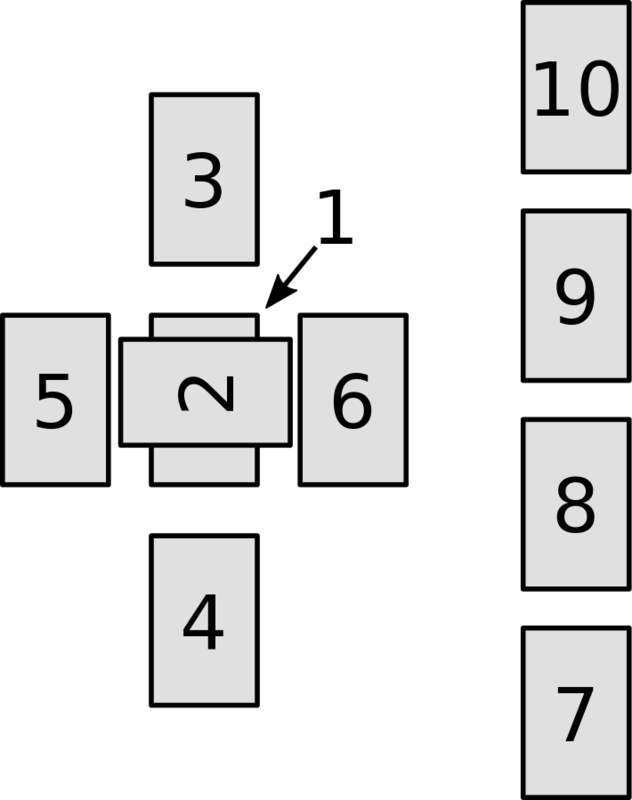 While some people believe in master numbers (such as #22), the base meanings are what is needed to be considered for the purpose of interpretation. Therefore, 10 will mean 1+0 = 1 and 22 will mean 2+2 = 4, and so on. Keep an eye on recurring numbers when conducting your readings. Also look at combinations, such as 3 and 6, which can be interpreted as artistic expression, or 2 and 7 – meaning the possibility of depression and/or spiritual analysis. Deepen the understanding of your interpretations by learning more about Numerology. Take the time to absorb the energies of each card, by focusing on the imagery, colors, numbers and symbols. Keep a Tarot journal and record your impressions of each card. Some people like to place a card under their pillow before going to sleep, then recording their impressions and dreams in the morning. Seeing as the Tarot is a story, you might want to use your own narrative when exploring the cards. Find a quiet place where you won’t be disturbed. Starting with the Major Arcana and working through the Minor Arcana and Court cards, place each card – one by one on a table in front of you. Meditate on the card and once you’ve memorized the imagery, close your eyes and think about what that card means to you. Let it happen naturally – even if you feel that your mind is wandering – watch where it goes and record your impressions. Repeat this with each card and revisit this meditation every now and then. Another meditation is to carry the card with you all day – especially if the symbolism matches what kind of a day you think you’re going to have. You can also choose a card that represents what you want to happen. Keep an eye out for anything related to the card and record your experiences once you get home. There are 78 cards in the Tarot and countless combinations including the multitude of different questions you might ask, so the idea of memorizing all of the cards can be a daunting one. Understanding that it will take time to learn the many facets of all 78 cards is the first step. Break it up into sections to make it more workable for you, such as beginning with the suits in the minor arcana. Or you might like to work on the Court cards to begin with, then move on to the suits, then to the major arcana. However you decide to do it, focus on each section and once you feel that it’s time, move on through the deck. Take note of recurring themes, images and combinations that feed meaning to each other. For example: you might notice that all the pages represent young people and new situations, but the suit changes the focus – such as wands (ideas), cups (emotions) and so on. A useful skill is where you see the individual meaning of each card as well as the overarching interpretation when combined with other cards. Using keywords is another useful method of memorizing the meanings and interpretations. Write them in your Tarot journal and commit them to memory. Creative visualization is a great way to remember anything, so if you go back to the idea of reading the Tarot as a story, you’ll remember each card as it pertains to the narrative of the Tarot. For example: think of each card as a chapter – feeding from the previous card and flowing onto the next. 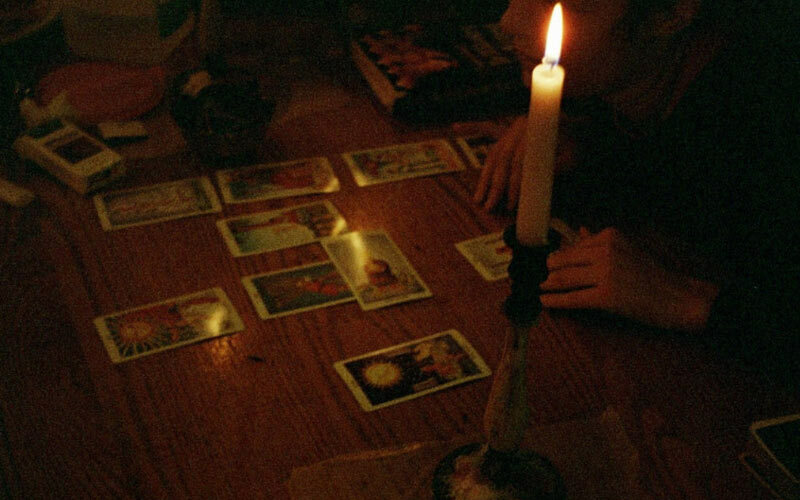 Having a sacred space where you can conduct your research and Tarot readings – respectfully and undisturbed – means that you will have a better chance for aligning yourself with your cards. Find an area where you’re less likely to be distracted by other people, noise from the street, TV etc. Decorate the area according to how you feel about your sacred space, the Tarot, spirituality etc. For some it might be crystals, plants and silk scarves; for others it could be New Age pictures on the wall and incense. Whatever your choices, make sure your area is a true reflection of who you are spiritually. There are so many different types of Tarot spreads, so it’s a good idea to explore what works for you. You will find that it depends on the type of reading you’re going to do, whether it’s a short – one question reading or a complex, 12 month spread or Celtic Cross. If you plan to deal Tarot cards for others, get them to shuffle and hand the deck back to you. Try not to interpret the cards according to what you think they want to know and advise them that you will only reveal what the cards say. Tell them not to let you know what they’re asking, which is a great way to test the reading and your skills. In your sacred space, take your cards and carefully shuffle them after meditating on the question and reason for the reading (unless reading for someone else.) When you feel that you’ve shuffled well, either fan them out (face down – from left to right) or cut the deck with your right hand from left to right if you’re only doing a one card spread. 1st Card: Your current position and state of mind. 2nd Card: Your challenge; what crosses you. 3rd Card: Your past, what brought you to this point in time. 4th Card: The near future. 5th Card: Current goals and aspirations. 6th Card: The subconscious thoughts behind your question; hidden secrets. 7th Card: Recommendations and advice for going forward. 8th Card: Events and/or people affecting your question; beyond your control. 9th Card: Your hopes and fears. If you’re doing a 6 card spread, you won’t need to spread the remaining four cards on the right side of the cross. In this instance, the first 5 cards have the same meanings as above, with the sixth card being your outcome. As before, shuffle the cards while you think of your question. You might ask “What is coming for me over the next month?” or “Tell me about such and such situation, person, event etc.” Fan the cards out and choose three cards quickly. Lay them out in a line from left to right. 2nd Card: Where you are now. After shuffling the cards and thinking of your question (make it simple and direct, such as “Will I get the job?” or “Should I trust my boyfriend/girlfriend?”) – cut them from left to right and pick the first card up from the top of the exposed stack. Interpret the answer and shuffle again and repeat if you want clarification. Shuffle and fan the cards, then choose twelve from left to right (which indicates going from the past to the future) and starting from directly in front of you – going clockwise – place the cards face down in a circle. You’ll need to neaten it up once you’re done. Starting from the first card, turn them over. The first card represents the current month and from the second card onwards, the following months will be represented by a card each. Interpret the reading and record your impressions in your journal. This is useful to remember your reading as well as to double check when the year is over. Here are some more spreads you might want to play with, from basic two card spreads up to five card spreads. Mix it up to create your own, once you feel comfortable enough to do so. Of course, this all depends on what’s going on in your life at any given time and what you want to know about. It’s important to be completely honest with yourself. If you already have an inkling that the relationship you just started will end in tears, a Tarot reading won’t give you alternate answers. Most of the time, us humans have a knack for being able to predict what’s going to happen, based on our histories and agendas. Using the Tarot to ask questions should be kept for the times when bigger issues are at hand, rather than for wishful thinking, petty things like gossip and other irrelevant topics. Keep your questions simple, such as “What’s coming for me over the next year?” or “Is it a good idea for me to apply for this job?” The best way to test yourself is to ask very basic questions, so you can ensure that you don’t inject the cards with an already programmed and desired outcome. Try to clear your mind and say out loud, “You tell me?” It’s amazing what can come up when you don’t force the issue or misinterpret the reading to suit yourself. Surprises and secrets can be unearthed when you don’t color your questions with convoluted imperatives and ulterior motives. As mentioned previously, it’s important to look at surrounding cards to get a better idea as to what the message is. Oftentimes, readings make more sense when all the cards are interpreted – like looking at the forest rather than the trees. How do they all relate to each other? Is there a common thread? Sometimes you’ll notice patterns, such as cards being predominantly pentacles or Queens. If there are a lot of Major Arcana cards then the reading denotes an important series of events coming up. The combinations are what makes the Tarot an intriguing method of divination, due to the depth of meaning. 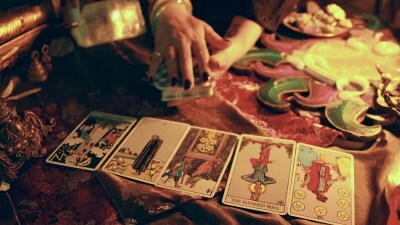 There are many variations on the astrological associations and other correspondences, depending on the different styles and traditions used by Tarot adherents – as well as the different schools of thought, where alternate ideas about what element or sign corresponds to what Tarot card are varied. Pentacles: Element – Earth; matters dealing with money, practical concerns, security, protection. Wands: Element – Air; matters dealing with the intellect, thought, ideas, intelligence. Swords: Element – Fire; matters dealing with power, energy, action, transformation, purification. Cups: Element – Water; matters dealing with emotions, the subconscious, creativity, dreams. Note: some people say that Wands are the element of fire and that Swords are the element of air. This is open to interpretation, but seeing as Wands usually come from wood = trees, it’s understandable that the branches waving in the air are attributed to that element, along with Swords forged in fire. You can figure out time frames based on which cards turn up in your reading. As a general rule of thumb, Major Arcana cards denote events that will be happening soon, the suits denote the seasons and the court cards denote the months or weeks. Timeframes depend on what kinds of questions you wish to ask. For example: if the question asks when something will happen, choose a one card reading. If you want to know more about surrounding issues, do a 3 card or 6 card reading and interpret the flow of events. The 12 card reading is a good way to pin down what will happen in each month for the following year. Whether you’re looking at it from an astrological or numerological point of view, the Tarot has a variety of characterizations you might resonate with. You might be drawn to the Queen of Pentacles because you’re a serious woman who is well-grounded, financially conservative and deeply intellectual. You might lean towards the Emperor as you believe you are in control, authoritative and wise. Thinking about your birthday – the number could indicate qualities associated with a particular card. It’s interesting to start a reading using the card that resonates with your personality as a starting point and it helps with focus. Find a notebook that you feel properly emulates the energies associated with the Tarot. Use it to record all your readings, impressions, research and meditations. Keep it with your cards and treat it as a kind of Book of Shadows, where your secrets and Tarot information are kept as sacred knowledge. Recording your readings in your Tarot journal offers a great way to test the outcomes, by checking after the fact when an event was predicted. Sometimes you’ll notice that things panned out differently than what was revealed in your reading. Go back to the record and note anything you missed or misinterpreted. A clarification card might be necessary when it seems that the cards aren’t revealing the answer you were looking for or if you can’t determine what the reading is telling you. Take the cards in question aside and focus on them while you re-shuffle the rest of the cards and ask for clarification. Split the deck and read the first card revealed. It should expand on your interpretation and shed some light on the issue. Keep in mind that sometimes you’re not supposed to know. For example: if the Moon card comes out, it indicates secrets and elements that are primarily in the subconscious – yet to be revealed. As a final note, you might have – from time to time – cards that jump out or fall out of the deck. Usually these are the most important cards to read. Once again, record them in your Tarot journal and check back from time to time to test whether or not the card was revealing something important for yourself. 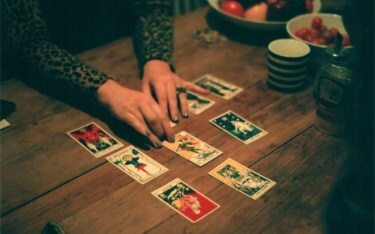 Learning how to read Tarot cards is an incredible journey that gives you insights into the past, present, and future. 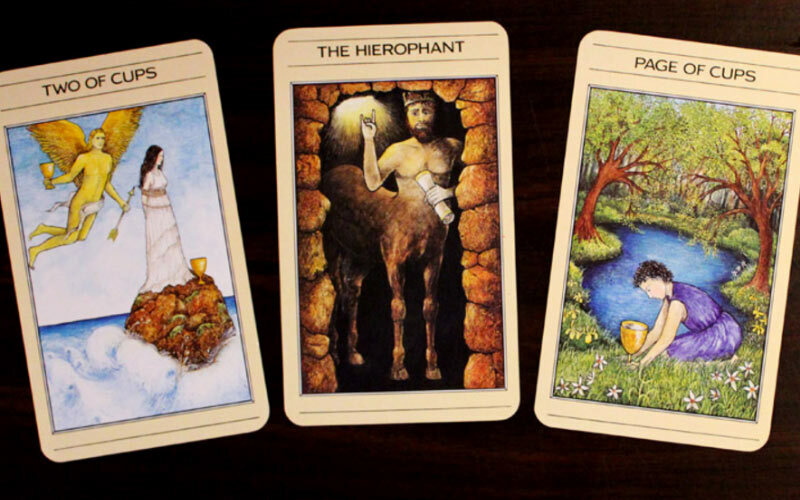 While it’s a fun pastime, you’ll discover that Tarot is more than a parlor game. It’s the story of your life.